Kieron Conway is fighting fit as he prepares to step up to eight rounds for his seventh professional contest this weekend. It will be seventh heaven if Conway’s hand is raised at the final bell, after six wins with two TKOs so far, having gone six rounds with Cristian Hoskin-Gomes in bout three. ‘KC’ lives and breathes boxing and trains full-time, thanks to backing from S & D Paving, and believes he’ll reap the benefits to the fullest. Manchester’s Monaghan possesses a favourable record with six wins, one loss and a draw from eight outings, having always seen the distance. Conway sees him as a scalp as he plots a path to the richest of prizes, having come through the ranks of Kings Heath Boxing Club as an amateur. “I train two to three times a day and the money from my sponsor keeps me going,” he explained. “If it wasn’t for them, I wouldn’t be where I am. “A happy fighter is a dangerous one and you can’t cut corners, it’s a dangerous sport and you have to give it the respect it deserves. “The old adage is you can’t play at boxing and it’s very true, I’m a position where I can dedicate myself and I’m lucky that I can. “My goal is to become a world champion one day, I know every fighter says the same but I have a one-track mind, that’s my ambition and I’m determined to get there.“All I’ve known for some time is winning, I boxed 84 times as an amateur and won 69 of them. I think I lost once in the last two years. “That was to Carl Fail, who’s a national champion and a mate of mine, he lives down the road so I still see him a lot! 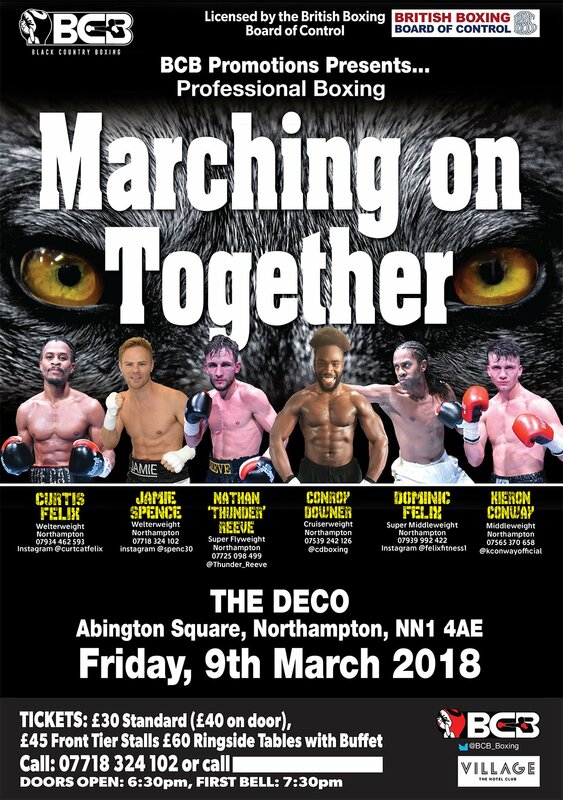 Other boxers from Northampton in action at the Deco include Jamie Spence, Nathan Reeve, Curtis Felix and Conroy Downer. Tickets are on sale, priced at £35 for standard entry, which will be £40 on the door. Seats in the front tier stalls are £45, with ringside £60 including a buffet. For more information and to buy, call 07718 324 102. The Deco doors will open at 6.30pm on the day of the show, with the first bell at 7.30pm.